Hurricane Mitch was the second-deadliest Atlantic hurricane on record, causing over 11,000 fatalities in Central America, with over 7,000 occurring in Honduras alone due to the catastrophic flooding it wrought, due to the slow motion of the storm. It was the deadliest hurricane in Central America, surpassing Hurricane Fifi–Orlene, which killed slightly fewer people there in 1974. The thirteenth named storm, ninth hurricane, and third major hurricane of the 1998 Atlantic hurricane season, Mitch formed in the western Caribbean Sea on October 22, and after drifting through extremely favorable conditions, it rapidly strengthened to peak at Category 5 status, the highest possible rating on the Saffir–Simpson Hurricane Scale. After drifting southwestward and weakening, the hurricane hit Honduras as a minimal hurricane. Mitch drifted through Central America, regenerated in the Bay of Campeche, and ultimately struck Florida as a strong tropical storm. It then became extratropical and accelerated northeastward across the North Atlantic, before dissipating on November 9. At the time, Mitch was the strongest Atlantic hurricane observed in the month of October, though it has since been surpassed by Hurricane Wilma of the 2005 season. In addition, Mitch is the eighth-most intense Atlantic hurricane on record. Mitch caused catastrophic impacts across its path, but the most disastrous impacts came from Honduras, which suffered over half of the total deaths. The President of Honduras estimated that Mitch set back 50 years of economic development. The storm wrecked about 35,000 houses and damaged another 50,000, leaving up to 1.5 million people homeless, or about 20% of the country's population. Mitch directly caused $2.005 billion in damage,[nb 1] with an additional $1.8 billion in indirect costs. Most of the damage was ruined crops, and cash crop exports were cut by 9.4% in 1999, largely due to the storm. Over 70% of the transportation infrastructure was damaged, mostly damaged highways and bridges. Widespread areas experienced power outages, and about 70% of the country lost water after the storm. In the capital, Tegucigalpa, a large landslide affected three neighborhoods and formed a temporary dam. Floods in the city damaged buildings that were over 350 years old. Throughout the country, there were at least 7,000 fatalities, some reported in each department. Following the storm, officials in Honduras requested international assistance, which totaled $2.8 billion over a several year period. Despite this, the gross domestic product began decreasing at the end of 1998, and contracted by 1.9% in 1999. Officials enacted a widespread curfew following the storm, and for 15 days temporarily restricted constitutional rights to maintain order. There were outbreaks in various diseases, and many residents faced food and water shortages. Due to the slow motion from October 29 to November 3, Hurricane Mitch dropped historic amounts of rainfall in Honduras, Guatemala, and Nicaragua, with unofficial reports of up to 75 inches (1,900 mm). Deaths due to catastrophic flooding made it the second deadliest Atlantic hurricane in history after the Great Hurricane of 1780; at least 11,374 people were confirmed to have been killed with over 11,000 left missing by the end of 1998; the true death toll may never be known. Additionally, roughly 2.7 million were left homeless as a result of the hurricane. Total damages caused by the hurricane were estimated to be around $6 billion (1998 USD). Tropical Depression Thirteen formed on October 22 over the southwestern Caribbean Sea, from a tropical wave that exited Africa on October 10. It executed a small loop, and while doing so intensified into Tropical Storm Mitch. A weakness in a ridge allowed the storm to track slowly to the north. After becoming disorganized due to wind shear from an upper-level low, Mitch quickly intensified in response to favorable conditions, including warm waters and good outflow. It became a hurricane on October 24 and developed an eye. After turning to the west, Mitch rapidly intensified, first into a major hurricane on October 25 and then into a Category 5 on the Saffir-Simpson Hurricane Scale the next day. At peak intensity, Mitch maintained maximum sustained winds of 180 mph (285 km/h) while off the northern coast of Honduras. Hurricane Hunters reported a minimum barometric pressure of 905 mbar (26.7 inHg), which at the time was the lowest in the month of October and tied for the fourth lowest for any Atlantic hurricane. Initially, the National Hurricane Center (NHC) and various tropical cyclone forecast models anticipated a turn to the north, threatening the Yucatán peninsula. Instead, Mitch turned to the south, due to a ridge that was not observed while the storm was active. Land interaction imparted weakening, and the hurricane made landfall on Honduras on October 29 with winds of 80 mph (130 km/h). Mitch slowly weakened while turning to the west over land, maintaining deep convection over waters. After moving across mountainous terrain in Central America, the surface circulation of Mitch dissipated on November 1. The next day, the remnants reached the Gulf of Mexico, which reorganized into a tropical storm on November 3. Mitch accelerated to the northeast ahead of a cold front, moving across the Yucatán peninsula before striking near Naples, Florida on November 5. Shortly thereafter, the storm became an extratropical cyclone, which was tracked by the NHC until November 9, at a point north of Scotland. Due to the threat, the government of Honduras evacuated some of the 45,000 citizens on the Bay Islands and prepared all air and naval resources. The government of Belize issued a purple alert and asked for citizens on offshore islands to leave for the mainland. Because the hurricane threatened to strike near Belize City as a Category 4 hurricane, much of the city was evacuated in fear of a repeat of Hurricane Hattie 37 years earlier. Guatemala issued a purple alert as well, recommending boats to stay in port, telling people to prepare or seek shelter, and warning of potential overflowing rivers. By the time hurricane Mitch made landfall, numerous people were evacuated along the western Caribbean coastline, including 100,000 in Honduras, 10,000 in Guatemala, and 20,000 in the Mexican state of Quintana Roo. 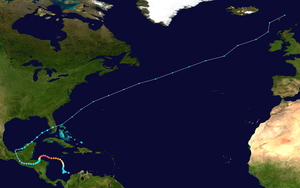 Hurricane Mitch was the deadliest Atlantic hurricane since the Great Hurricane of 1780, displacing the Galveston Hurricane of 1900 as the second-deadliest on record. Nearly 11,000 people were confirmed dead, and almost as many reported missing. Deaths were mostly from flooding and mudslides in Central America, where the slow-moving hurricane and then tropical storm dropped nearly 36 inches (900 mm) of rain. The flooding and mudslides damaged or destroyed tens of thousands of homes, with total damage amounting to over $5 billion (1998 USD, $6 billion 2006 USD), most of which was in Honduras and Nicaragua. Prior to Mitch, the deadliest hurricane in Central America was Hurricane Fifi in 1974, which killed an estimated 8,000–10,000. While offshore northern Honduras, Hurricane Mitch passed over Guanaja island. High waves eroded northern coastlines and damaged lagoons. Most of the Bay Islands had damage to their water facilities. Two days of winds exceeding 200 km/h (120 mph) destroyed nearly all of the plants and trees on Guanaja, uprooting or knocking down almost the entire mangrove forest. It is estimated that the hurricane produced waves of 44 ft (13 m) in height. While moving slowly for several days offshore Honduras, Hurricane Mitch drew moisture from the Pacific Ocean and the Caribbean Sea, producing high amounts of rainfall of over 300 mm (12 in) per day. The highest official total was 928 mm (36.5 in) at Choluteca, which represented more than half of the annual precipitation average; at the same location, 466.7 mm (18.37 in) fell in a 24-hour period on October 31, which was more than double of the previous record set in 1985. There were unofficial rainfall totals in Central America as high as 1,900 mm (75 in); rain gauges in mountainous areas were washed away. The high rainfall caused many rivers in the country to overflow "to an unprecedented extent this century", as described by the United Nations. The rainfall collected in rivers, causing extensive river flooding across the country. The greatest depth recorded was 12.5 m (41 ft) on the Ulúa River near Chinda, whilst the greatest width recorded was 359 m (1,178 ft) on the Río Lean near Arizona. The rainfall also caused widespread mudslides across the mountainous country. In the country's interior, particularly the southern portion, the high rainfall caused hundreds of landslides, many of them shallow and about 95% in the form of debris flow. However, two earthflows caused significant damage near Tegucigalpa. Hurricane Mitch wrought significant damage to Honduras, affecting nearly the entire population and causing damage in all 18 departments. The United Nations Economic Commission for Latin America and the Caribbean estimated that Mitch caused the worst floods of the 20th century in the country. An estimated 70–80% of transportation network was destroyed, including most bridges and secondary roads, amounting to $236 million in damage. Hurricane Mitch left widespread power outages after damaging more than 385 km (239 mi) of power lines and several power plants. About 70% of Honduras lost access to fresh water after the storm, although many rural areas had already been experiencing water shortages. The combined damage to transportation, communication, utilities, including power and water, was estimated at $665 million. High water levels along the Choluteca River affected the capital, Tegucigalpa, reaching levels 10 m (33 ft) above their banks. The floods damaged about one-third of buildings, including some more than 350 years old. Across Honduras, agriculture sustained serious damage, with initial estimates of 70% of crops destroyed. About 50,000 bovine were killed, as were 60% of the fowl population. Crop and agricultural damage totaled about $1 billion, which would take the country years to recover. Honduras's Social Fund for Housing estimated that 35,000 houses nationwide were destroyed with another 50,000 damaged, leaving 1.5 million people homeless – about 20% of the total population. This was the highest number of victims from any natural disaster in Honduras's history. Overall, Hurricane Mitch killed about 7,000 people in Honduras, and damage was estimated at L52,345,000,000 ($3.8 billion), of which $2.005 billion was from direct damages and the remainder from indirect costs. The overall impact represented about 70% of Honduras's annual gross domestic product (GDP). Though Mitch never entered Nicaragua, its large circulation caused extensive rainfall, with estimates of over 50 inches (1,300 mm). In some places, as much as 25 inches (630 mm) of rain fell on coastal areas. The flank of the Casita Volcano failed and turned into a lahar from excessive rain. The resulting mudslide ultimately covered an area 10 miles (16 km) long and 5 miles (8 km) wide. Two million people in Nicaragua were directly affected by the hurricane. Across the country, Mitch's heavy rains damaged 17,600 houses and destroyed 23,900, displacing 368,300 of the population. 340 schools and 90 health centers were severely damaged or destroyed. Sewage systems and the electricity subsector were severely damaged, and, combined with property, damage totaled to $300 million (1998 USD). Transportation was greatly affected by the hurricane, as well. The rainfall left 70% of the roads unusable or destroyed and greatly damaged 92 bridges. Over 1,700 miles (2700 km) of highways or access roads needed replacement subsequent to the storm, especially in the northern part of the country and along portions of the Pan-American Highway. Total transportation damage amounted to $300 million (1998 USD). Agricultural losses were significant, including the deaths of 50,000 animals, mostly bovines. Crops and fisheries were affected greatly as well, and, combined with agricultural losses, damage totaled to $185 million (1998 USD). The situation was further compounded by a total of 75,000 live land mines—left over from the Contra insurgency of the 1980s—that were calculated to have been uprooted and relocated by the floodwaters. In all, Hurricane Mitch caused at least 3,800 fatalities in Nicaragua, of which more than 2,000 were killed in the towns of El Provenir and Rolando Rodriguez from the landslide at the Casita volcano. The mudslide buried at least four villages completely in several feet of mud. Throughout the entire country, the hurricane left between 500,000 and 800,000 homeless. In all, damage in Nicaragua is estimated at around $1 billion (1998 USD). Mitch was also responsible for the loss with all hands of Windjammer Barefoot Cruises' schooner Fantome. The story was recorded in the book The Ship and The Storm by Jim Carrier. The schooner, which was sailing near the center of the hurricane, experienced over 50 foot (15 m) waves and over 100 mph (160 km/h) winds, causing her to sink off the coast of Honduras. On the south coast of Cuba, the hurricane caused waves of up to 13 feet (4 m) high and winds gusts peaking at 42 mph (67 km/h), causing numerous tourists and workers on the Isle of Youth and Cayo Largo del Sur to leave for safer grounds. In Jamaica, where officials declared hurricane warnings 12 hours prior to its closest approach, Mitch caused moderate rainfall and gusty winds for days. Strong waves hit western Jamaica, with wave heights unofficially estimated at nearly 7 feet (2 m) in height. The rainfall in outer rainbands, at times severe, flooded many roads across the island and left them covered with debris. One house in Spanish Town collapsed from the flooding, leaving four homeless. Many other homes and buildings were flooded, forcing many to evacuate. A river in northeastern Jamaica overflowed its banks, while heavy rainfall across the mountainous parts of the country caused numerous mudslides. In all, Mitch killed three people on Jamaica. On the Cayman Islands, the hurricane caused strong waves, gusty winds, and heavy rainfall at times. Damage was relatively minimal, amounting to blown out windows and beach erosion. Strong waves damaged or destroyed many docks on the south shore of the islands, and also sank one dive ship near Grand Cayman. In addition, numerous incoming and outgoing flights were cancelled. Due to Mitch's large circulation, it dropped heavy precipitation as far south as Panama, especially in the Darién and Chiriquí provinces. The flooding washed away a few roads and bridges, and damaged numerous houses and schools, leaving thousands homeless. The hurricane left three casualties in Panama. In Costa Rica, Mitch dropped heavy rains, causing flash flooding and mudslides across the country, mostly in the northeastern part of the country. The storm impacted 2,135 homes to some degree, of which 241 were destroyed, leaving 4,000 homeless. Throughout the country, the rainfall and mudslides affected 126 bridges and 800 miles (1,300 km) or roads, mostly on the Inter-American Highway which was affected by Hurricane Cesar, two years prior. Mitch affected 115 sq. miles (300 km2) of crop lands, causing damage to both export and domestic crops. In all, Hurricane Mitch caused $92 million in damage (1998 USD) and seven deaths. While drifting through El Salvador, the hurricane dropped immense amounts of precipitation, resulting in flash flooding and mudslides through the country. Multiple rivers, including the Río Grande de San Miguel and the Lempa River overflowed, contributing to overall damage. The flooding damaged more than 10,000 houses, leaving around 84,000 homeless and forcing 500,000 to evacuate. Crop damage was severe, with serious flooding occurring on 386 sq. miles (1000 km2) of pasture or crop land. The flooding destroyed 37% of the bean production, 19% of the corn production, and 20% losses in sugar canes. There were heavy losses in livestock as well, including the deaths of 10,000 cattle. Total agricultural and livestock damaged amounted to $154 million (1998 USD). In addition, the flooding destroyed two bridges and damaged 1,200 mi (1,900 km) of unpaved roads. In all, Mitch caused nearly $400 million in damage (1998 USD) and 240 deaths. Similar to the rest of Central America, Mitch's heavy rains caused mudslides and severe flooding over Guatemala. The flooding destroyed 6,000 houses and damaged 20,000 others, displacing over 730,000 and forcing over 100,000 to evacuate. In addition, the flooding destroyed 27 schools and damaged 286 others, 175 severely. Flooding caused major damage to crops, while landslides destroyed crop land across the country. The most severely affected crops for domestic consumption were tomatoes, bananas, corn, other vegetables, and beans, with damaged totaling to $48 million (1998 USD). Export crops such as bananas or coffee were greatly damaged as well, with damage amounting to $325 million (1998 USD). Damage to plantations and soil totaled to $121 million (1998 USD). The flooding also caused severe damage to the transportation infrastructure, including the loss of 37 bridges. Across the country, flooding damaged or destroyed 840 miles (1350 km) of roads, of which nearly 400 miles (640 km) were sections of major highways. In all, Hurricane Mitch caused $748 million (1998 USD) and 268 deaths in Guatemala. In addition, Mitch caused 11 indirect deaths when a plane crashed during the storm. In Belize, the hurricane was less severe than initially predicted, though Mitch still caused heavy rainfall across the country. Numerous rivers exceeded their crests, though the rainfall was beneficial to trees in mountainous areas. The flooding caused extensive crop damage and destroyed many roads. Throughout the country, eleven people died because of the hurricane. In Mexico, Mitch produced gusty winds and heavy rains on the Yucatán Peninsula, with Cancún on the Quintana Roo coast being the worst hit. Nine people were killed from the flooding, though damage was relatively minimal. The maximum 24-hour rainfall total from Mitch was 13.4 inches (340 mm) in Campeche, while the highest rainfall total was 16.85 inches (428.0 mm) in Ciudad del Carmen. Then a tropical storm, Mitch caused a storm surge of up to 4 feet (1.2 m) in the lower Florida Keys before making landfall on the Florida west coast. Key West International Airport reported peak wind gusts of 55 mph (89 km/h) and sustained winds of 40 mph (64 km/h), the only report of tropical storm force in the state. Offshore, the Fowey Rocks Light reported a wind gusts of 73 mph (117 km/h). In addition, Mitch caused moderate rainfall, peaking at 7 inches (200 mm) in Jupiter, though some estimates indicate localized totals of up to 10 inches (250 mm). The storm spawned five tornadoes over the state, the strongest of which was an F2. In the Florida Keys, multiple buildings that had been damaged by Hurricane Georges were leveled by Mitch. Tornadoes from the storm damaged or destroyed 645 houses across the state, in addition to injuring 65 people. Gusty winds left 100,000 without power during the storm's passage. In all, Mitch caused $40 million in damage (1998 USD) in Florida and two deaths from drowning when two boats capsized. As an extratropical cyclone, Mitch passed west of Ireland and the United Kingdom. In Ireland, the storm produced gusts as high as 90 mph (140 km/h) and 30 ft (9.1 m) waves. The winds knocked down trees and power lines, leaving over 30,000 homes without power. One tree fell onto a car in Louth, severely injuring the driver. In Dublin, high winds knocked the roof off of a building, and several other buildings nationwide were damaged. The storm caused airports to close and ferry service to be suspended. As a result of the hurricanes impact's the name Mitch was retired from the Atlantic naming list by the World Meteorological Organization and will not be used for a future Atlantic hurricane. The name was replaced with the name Matthew when the list of names was reused, during the 2004 season. After the disaster caused by Hurricane Mitch, countries around the world donated significant aid, totaling $6.3 billion (1998 USD). Throughout Central America, which was recovering from an economic crisis that occurred in 1996, many wished to continue the growth of the infrastructure and economy. In addition, after witnessing the vulnerability to hurricanes, the affected governments endeavored to prevent such a disaster from occurring again. Hundreds of thousands of people lost their homes, but many took this as an opportunity to rebuild stronger houses. With a new, structurally improved foundation, homes were redesigned to be able to withstand another hurricane. However, lack of arable crop land took away the jobs from many, decreasing an already low income even lower. Following the passage of Mitch, disease outbreaks occurred throughout Central America, including cholera, leptospirosis, and dengue fever. Over 2,328 cases of cholera were reported, killing 34 people. Guatemala was most affected by the bacterium, where most of the deaths occurred from contaminated food. 450 cases of leptospirosis were reported in Nicaragua, killing seven people. There were over 1,357 cases of dengue reported, though no deaths were reported from the disease. While stalling over the western Caribbean Sea, Mitch's strong winds produced strong waves, damaging local coral reefs. Later, the storm's immense rainfall led to runoff polluted with debris and fresh water. This resulted in diseases occurring within the coral. However, the hurricane's upwelling cooled the warm water temperatures, preventing significant bleaching and destruction of the coral reef. Mitch caused such massive and widespread damage that Honduran President Carlos Roberto Flores claimed it destroyed fifty years of progress in the country. Honduras, the country most affected by the hurricane, received significant aid for the millions impacted by the hurricane. Mexico quickly gave help, sending 700 tons of food, 11 tons of medicine, four rescue planes, rescue personnel, and trained search dogs. Cuba also volunteered, sending a contingent of physicians to the country. The U.S. administration offered at first troops stationed in Honduras, and then withdrew them a few days after the storm. They also at first offered only $2 million (1998 USD) in aid, which came as a shock to residents, and president Carlos Roberto Flores alike. The U.S. later increased their offer to $70 million (1998 USD). The Honduran government distributed food, water, and medical services to the hurricane victims, including the more than 4 million without water. In addition, the country initially experienced a sharp increase in the unemployment rate, largely due to the destruction of crop lands. However, rebuilding provided jobs in the following years. In Costa Rica, reconstruction after the hurricane increased the number of jobs by 5.9%, lowering the unemployment rate slightly. ^ All damage totals are in 1998 United States dollars unless otherwise noted. ^ "Atlantic hurricane best track (HURDAT version 2)". Hurricane Research Division (Database). National Hurricane Center. May 1, 2018. Retrieved April 17, 2019. ^ a b c d e f g h i j k l m n John L. Guiney; Miles B. Lawrence (1999-01-28). Hurricane Mitch Preliminary Report (PDF) (Report). National Hurricane Center. Retrieved 2013-05-12. ^ Miles Lawrence (1998-10-24). Hurricane Mitch Discussion Number 11 (Report). National Hurricane Center. Retrieved 2013-05-12. ^ Lixion Avila (1998-10-24). Hurricane Mitch Discussion Number 12 (Report). National Hurricane Center. Retrieved 2013-05-12. ^ Ed Rappaport (1998-10-24). Hurricane Mitch Discussion Number 10 (Report). National Hurricane Center. Retrieved 2013-05-12. ^ Ed Rappaport (1998-10-28). Hurricane Mitch Discussion Number 29 (Report). National Hurricane Center. Retrieved 2013-05-12. ^ Miles Lawrence (1998-10-30). Tropical Storm Mitch Discussion Number 36 (Report). National Hurricane Center. Retrieved 2013-05-12. ^ a b "Hurricane Mitch could spare Honduras and slam into Yucatán". ReliefWeb. Agence France-Presse. 1998-10-27. Retrieved 2012-01-05. ^ a b c d e f g h i j k l m n o p q r s t u v w x y z aa ab National Climatic Data Center (2004). "Mitch: The Deadliest Atlantic Hurricane Since 1780". United States National Oceanic and Atmospheric Administration. Archived from the original on 2012-07-17. Retrieved 2006-04-25. ^ Juan Carlos Ulate (1998-10-29). "Hurricane Mitch at standstill, pounding Honduras". ReliefWeb. Reuters. Retrieved 2012-01-05. ^ a b c d e f g Centre for Research on the Epidemiology of Disasters. "EM-DAT: The OFDA/CRED International Disaster Database". Université catholique de Louvain. Retrieved 2012-11-30. ^ a b c d Inter-American Development Bank. "Central America After Hurricane Mitch- Costa Rica". Archived from the original on December 19, 2005. Retrieved 2006-04-28. ^ a b c d Inter-American Development Bank (2004). "Central America After Hurricane Mitch- El Salvador". Archived from the original on October 26, 2005. Retrieved 2006-04-25. ^ a b c Inter-American Development Bank (2004). "Central America After Hurricane Mitch- Guatemala". Archived from the original on December 19, 2005. Retrieved 2006-04-25. ^ "British Aid For Hurricane Victims". BBC News. 1998-11-04. Retrieved 2007-09-22. ^ a b Inter-American Development Bank (1998). "Central America after HurricaneMitch- Honduras". Archived from the original on December 19, 2005. Retrieved 2006-04-28. ^ a b c d e Description of the Damage (PDF). Honduras: Assessment of the damage caused by hurricane Mitch, 1998. Implications for economic and social development and for the environment (Report). Economic Commission for Latin America and the Caribbean. April 1999. Retrieved 2013-06-07. ^ a b c d e f Central America After Hurricane Mitch: The Challenge of Turning a Disaster into an Opportunity (Report). Inter-American Development Bank. 2000. Archived from the original on April 19, 2013. Retrieved 2013-05-22. ^ Philippe Hensel; C. Edward Proffitt (2002-10-07). Hurricane Mitch: Acute Impacts on Mangrove Forest Structure and an Evaluation of Recovery Trajectories (PDF) (Report). United States Geological Survey. Archived from the original (PDF) on February 18, 2013. Retrieved 2013-05-24. ^ Mitch: The Deadliest Atlantic Hurricane Since 1780 (Report). National Climatic Data Center. 2009-01-23. Retrieved 2013-05-20. ^ a b c d e f g Economic Commission for Latin America and the Caribbean (1999-04-14). Honduras: Assessment of the Damage Caused by Hurricane Mitch, 1998 (PDF) (Report). United Nations. Retrieved 2013-05-23. ^ United States Geological Study (2002). "Hurricane Mitch:Peak discharge for selected rivers in Honduras" (PDF). Archived from the original (PDF) on May 2, 2006. Retrieved 2006-04-25. ^ Edwin L. Harp; Mario Castañeda; Matthew D. Held (2002). Landslides Triggered By Hurricane Mitch In Tegucigalpa, Honduras (PDF) (Report). United States Geological Survey. Retrieved 2013-05-24. ^ a b ERRI Watch Center. "Real-Time Reports Concerning the Devastation Caused by Hurricane Mitch". Archived from the original on April 22, 2006. Retrieved 2006-04-28. ^ Thomas W. Doyle; Thomas C. Michot; Fred Roetker; Jason Sullivan; Marcus Melder; Benjamin Handley; Jeff Balmat (2002). "Hurricane Mitch: Landscape Analysis of Damaged Forest Resources of the Bay Islands and the Caribbean Coast of Honduras" (PDF). United States Geological Study. Retrieved 2011-02-28. ^ a b Inter-American Development Bank. "Central America After Hurricane Mitch-Nicaragua". Archived from the original on December 15, 2005. Retrieved 2006-04-28. ^ United States Geological Survey (2010-01-21). "Hurricane Mitch, Central America". Archived from the original on 2014-06-27. Retrieved 2011-02-28. ^ Alexa Smith (November 23, 1998). "Call-In Day Set to Push For Landmine Ban". World Faith News. Archived from the original on 2007-09-29. ^ Cynthia Corzo, Curtis Morgan and John Barry Herald Staff Writers. "The Loss of the Windjammer, Fantome". Retrieved 2006-04-28. ^ Angus MacSwan (1998-10-27). "Ferocious Hurricane Mitch threatens Central America". ReliefWeb. Reuters. Retrieved 2012-01-05. ^ "Unofficial Reports from Jamaica". Retrieved 2006-04-28. ^ "Unofficial Reports from the Cayman IslandsJamaica". 1998. Retrieved 2006-04-28. ^ "Report from Panama". Retrieved 2006-04-28. ^ a b c d e "Mitch: A path of destruction". BBC. 1998-12-03. Retrieved 2006-04-28. ^ "Unofficial Reports from Belize". Retrieved 2006-04-28. ^ Servicio Meterologial Nacional (1998). "Huracán "MITCH" del Océano Atlántico" (in Spanish). Archived from the original on October 4, 2006. Retrieved 2006-10-12. ^ David Roth (2006). "Hurricane Mitch Rainfall Data". Hydrometeorological Prediction Center. Retrieved 2006-10-16. ^ Jay Barnes (2007). Florida's Hurricane History. 0807830682. p. 304. ISBN 0-8078-2443-7. ^ Lynne Kelleher (1998-11-10). "Hurricane Mitch leaves 30,000 homes in dark out after night of chaos". The Mirror. London. Retrieved 2013-06-10. ^ "Retired Hurricane Names Since 1954". United States National Hurricane Center. 2018. Retrieved September 8, 2018. ^ a b Inter-American Development Bank (2004). "Central America After Hurricane Mitch". Archived from the original on December 19, 2005. Retrieved 2006-04-25. ^ Allen Clinton, CARE Press Officer. "Remembering Hurricane Mitch for Better and for Worse". Retrieved 2006-04-30. ^ Pan-American Health Organization. "Disease Threat following Hurricane Mitch". Retrieved 2006-04-30. ^ United States Geological Survey. "Coral Reefs in Honduras: Status after Hurricane Mitch". Archived from the original on April 17, 2006. Retrieved 2006-04-30. ^ "Update #9 on Hurricane Mitch". Archived from the original on 2013-06-12. Retrieved 2014-11-19. ^ Paul Jeffrey (November 18, 1998). "After the storm — aftermath of Hurricane Mitch in Honduras". The Christian Century. Retrieved 2006-05-03.